Hi Everyone! Those who managed to make it to the first Australia-NZ OT Meeting in Sydney in 2013 know how professional, knowledgeable and nice Dr Julian Rodrigues is. 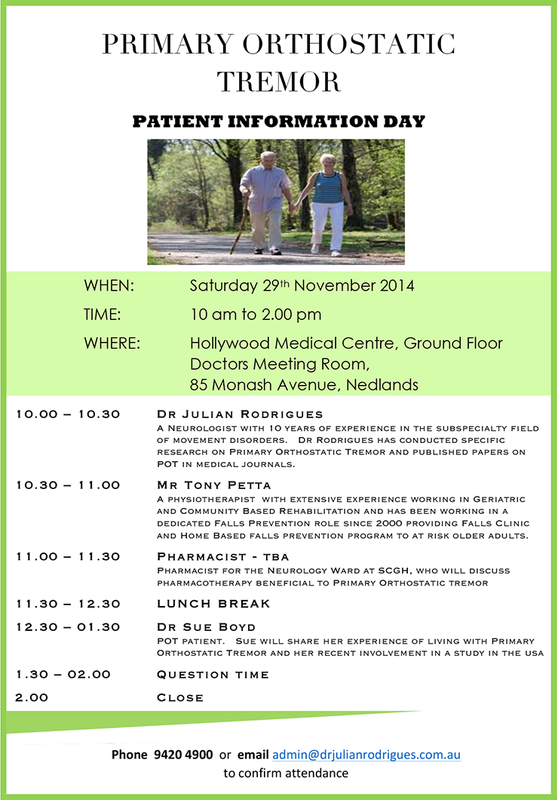 He is a Perth-based neurologist specialising in movement disorders who has a particular interest in OT. Most of his patients could not make it over to Sydney, and so he is now putting on a special Patient POT Information Day here in Perth. Members of the POT Community are very welcome to come and join us. For those of you shivering in the Northern Hemisphere, know that is nice and warm here!! if you need any help or advice, let me know. Sorry for the short lead time. Sue: any info or papers to come out of the day?